We don’t share tube-shaped mechanical mods that much anymore, but this one definitely caught our eye. Originally created by Comp Lyfe, the Defend Able Mechanical Mod is powered by single 18650 battery and comes in several different styles and finishes – made with brass, copper and/or brass. What makes it really cool is the hollow external tube which can be replaced to completely change the look of your device. Choose from a hollow point design, knurled and several painted options. 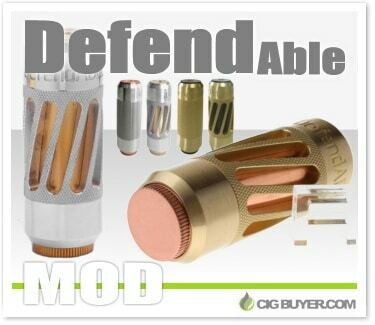 The DefendAble Mod has an adjustable bottom-fire button with opposing earth magnets.